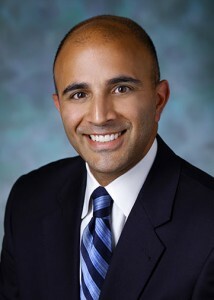 Ask Johns Hopkins Medicine physicians which of their colleagues has a strong online presence, and one of the names that you’re likely to hear is that of orthopaedic spine surgeon A. Jay Khanna. Khanna views his online footprint as a critical element of building his practice. It’s so important that he’s positioned iPads at checkout stations in each of his practice locations. Those iPads do more than just gather feedback. Unique software actively encourages patients to rate his performance and to post their comments on third-party websites, such as Vitals and Healthgrades, for all the world to see. Such a level of transparency may seem intimidating, but take a few minutes to Google Jay Khanna or to read patient reviews on sites like Vitals and you’ll see the benefits. His online footprint is strong, with review sites and professional sites all pointing Web searchers toward his Johns Hopkins Medicine profile. Khanna is a co-author of the chapter “Social Intelligence About The Patient Experience” in the book Applying Social Media Technologies in Healthcare Environments and an advisor to Binary Fountain — providers of a consumer experience and reputation management software solution. I was intrigued to speak with a physician who so clearly embraces social technologies. His chapter reveals that while he understands the vulnerability of physicians in this environment, his outlook is overwhelmingly positive. He welcomes the increasing accountability and sees the opportunities to better serve patients and to effectively market his services. A strong online footprint is just as important as providing good-quality care, communicating with referring doctors, and being nice to patients by giving them proper time and attention. The first question I ask patients while I open their chart in Epic is who referred them to me. Over the last five years, it’s gone from 20 percent finding me on the Internet to about 50 percent. When a grateful patient asks how they can help you, ask them to write a review on Vitals.com. Vitals is one of the few websites where users are able to provide a free text review along with their ratings. The comments provide credibility, especially if the patient decides to include his or her name. Put iPads in the waiting rooms or at the checkout desk. It takes patients 30 to 50 seconds. And they’ll provide you with invaluable, real-time data. If there’s a need for service recovery, you can do that immediately. Operational issues often impact physician ratings just as much as the interaction with the physician. Make sure that your staff members know exactly what questions are on the survey. When they understand the importance of their role in the patient experience, they bring their A-game, too. My profile on hopkinsmedicine.org really makes a difference. Today, it presents videos, my training, and clinical and research interests, and it’s much nicer to have that on a Johns Hopkins-branded website. Take a few minutes to review your own Johns Hopkins online profile page and confirm that information, such as your phone number, address and clinical interests, are up to date. The more content you have out there, the more patients you’ll drive to your website. Web pages through specialty societies, such as the North American Spine Society and the American Academy of Orthopaedic Surgeons, can all be linked to one another and drive people toward the Johns Hopkins-branded page.